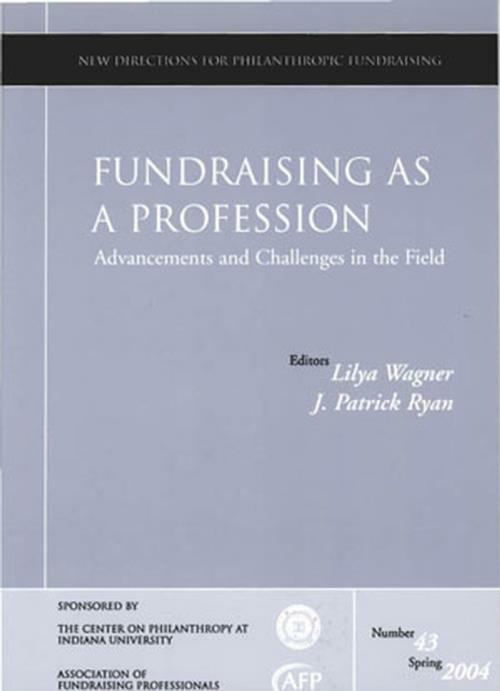 Examines progress being made in achieving professionalism in the fund–raising field. Presents current analysis on training, compensation, accountability, diversity and gender differences, and organizational team–building. Editors Notes (Lilya Wagner, J. Patrick Ryan). Fundraising has achieved a professional status, but during this difficult time when its legitimacy is being questioned, constant vigilance and effort are needed to monitor, defend, and improve its position. Fundraising as a profession has seen enormous growth due to the literature and research that have formalized it. Today the many training and educational programs that are available continue to bolster its growth as a profession. Certification has increasingly received attention as a necessity for achieving professional status in fundraising. This chapter describes how certificates, licensure, and certification differ and draws conclusions on their value. Accountability is a significant issue that affects fundraisers today. Tied to this are matters of compensation, which are addressed by the authors. Diversity is virtually a requirement in today s professional world, yet the fundraising profession has not achieved an acceptable state within its own ranks. The authors offer suggestions on how to raise diversity to an optimal level. Researchers and practitioners ask whether gender differences in giving really exist. This chapter takes a look at the latest viewpoints and evidence. A team approach to fundraising is not only a necessity but also a great factor in the success of any fundraising program. This article presents five fundamental success factors that come into play when building a team.